After being impressed by the woodpecker aluminum radius jigs I decided to make my own out of some scraps I had laying around the shop. And they work a treat. These are to be used either with a router table or a hand held trim router. Obviously these are a little delicate due to the thin walled fiber board being used as guiding blocks. I like them. Going to have to make a set. Can you show some shots of them in use? Also why not use some flat aluminum instead of fiber board? Hi guys. Sure I can shoot some pictures of them in use. I will do it today both with the plunge router and the router table. If FOG could slow down so I have a chance to make all of these awesome ideas that'd be great. On second thought, you guys don't need to slow down, I need to speed up. The lady is t going to be happy about this. ... but how did you make the nice radii on your jigs? I would like to know how you did this as well. 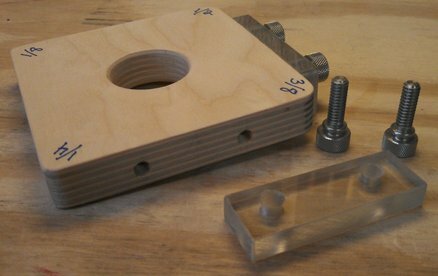 Another alternative to MFD would be 3/8" or 1/2" acrylic. He probably used circles templates? Thought most fellers on here pushed lead at one time. Wow, that picture takes me back! My question was how to he get the curve nice, smooth and true on the jig. I would use a piece of 1/4" stock draw out the curve, cut on the waste side then finish with a spokeshave until I had a fair curve that I was happy with, then use this with a flush trimming router bit to cut out the curve on my work piece. I was interested on how the op achieved his jigs which look perfect, as it always seems to take me ages until I am happy with the curve. My guess is that he had a friend with the Woodpecker templates (or something similar), used a bearing bit and made them himself. That is what I would do... on that note, anyone want to rent me a set of Woodpecker blocks?!?! Hi guys. Actually i just took my time with The stationary beltsander. Turned out good enough. I thought the same thing when I saw the woodpecker version and also made my own. Mine is closer to the woodpecker versuon; square with a different radius on each corner. The body is made of 3/4" baltic birch plywood. I drilled and tapped two holes on each side and use 3/8" polycarbonate stops, and two thumbscrews to hold them in place. The center hole helps a lot with holding the jig in place while I rout the corners at the router table. If I made another one I'd probably increase the size a bit. I know this is a really old thread but was wondering how did you create the radii on the corners? Rough cut and sand or something more precise? Rockler now sells a plastic set of these that is much more reasonable than the WP version. When I made my latest desk top and table top, I needed to make a fairly large radius corner. I found an appropriate size can to give me the arc I wanted, then made a similar jig for use with the OF1400. I have a good bit with top and bottom bearings, and it worked super. I traced the arc on the corner, removed most of the material with the Carvex, then clamped and routed the corner smooth. Here's a pic of the jig in use. And they are on sale right now too! REALLY wanted to pick up the Woodpeckers One Time Tool version, but they just want WAY too much money for them. 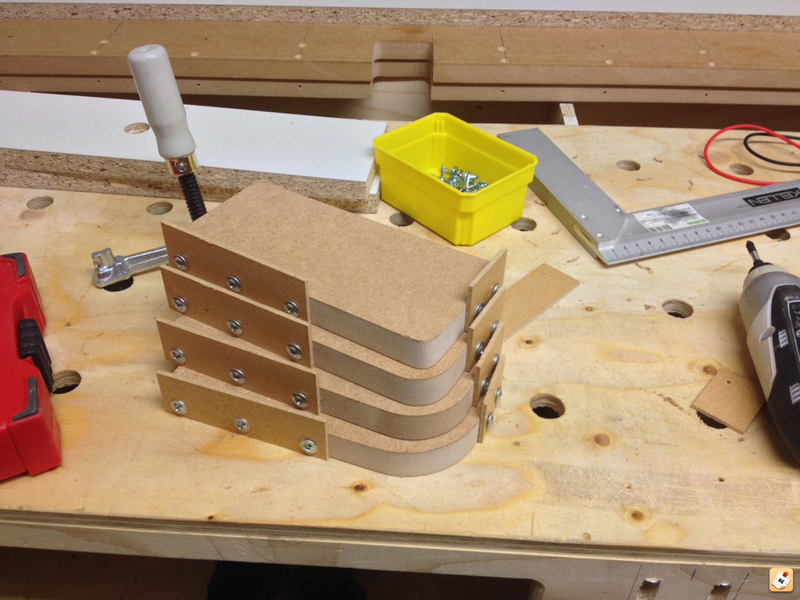 Here's a video showing a fixture used to make templates for any corner radius that you want. Truism...but they are sweet to use. I wonder what happened to the guy in the video, He has not made a video in several years. Plus the Woodpecker radius jig is flat topped, which for me is important as I often handhold a router and cut from the top. Not that one couldn't recess the 90* angle bracket, and counter sink the screws. I would gladly spend the money again for the Woodpeckers. I didn't bother getting the square edge attachments only the radius. Plus the Woodpecker radius jig is flat topped, which for me is important as I often handhold a router and cut from the top. Not that one couldn't recess the 90* angle bracket, and counter sink the screws. I would gladly spend the money again for the Woodpeckers. Ya, I had to think awhile before I ordered the set, however I'm surprised at how many times I've used it in the last 5-6 years. It's a nice product. I'm thinking about combining the Woodpeckers Corner Jig and the Woodpeckers Corner Radius Quick Jig into a single Systainer so everything is in one place. I watched all his videos last week when I was in a youtube vortex and wondered exactly the same thing. It’s a shame — his videos were very good. I met Kriss at Festool Connect last year. Neat guy. You might want to check him out on Instagram (Toolify). @Kriss - What are you working on now? Hey @Peter Halle - I appreciate the callout. Great meeting you too at Connect. First things first, I’m happy and well – but it’s true I’ve been overdue to explain why Toolify went silent. Honestly, thinking about making another Toolify video has been stressing me out and causing anxiety. Let me try my best to capture what changed, and what I’m excited about going forward. The FOG community has been very supportive and remains one of the few places on the internet I feel comfortable sharing stuff like this. Toolify peaked in revenue towards the end of 2015. At that time, I was so excited about the idea of making a living through YouTube woodworking (and the numbers sort of made it look possible) so I wanted to drop out of school (yes, really), at just 6 months away from completing my electrical engineering degree. After all, Toolify was basically the closest thing to my childhood dream. I definitely stressed out my parents – a lot – during this phase, and ultimately I didn’t even have the courage to follow through with the plan (all words, no action). At the end of it all, no-one knows what could/would have been, but I keep telling myself that it turned out the way it was meant to be. In April 2016, I graduated. That year, I attended the Atlanta woodworking show, Festool Connect , and also had the opportunity to organize and be part of a local YouTube woodworker meet and greet which included my woodworking idols… John Heisz and Matthias Wandel. Perhaps needless to say, at that time I was over the moon with excitement. The people which seemed so distant just 2 years back (when I started YouTube) were literally in my backyard. It was pretty surreal. I think that’s also when things went downhill. In hindsight, I lost sight of a goal and couldn’t keep up with the work necessary to maintain the channel. I kept working my day job, but instead of making Toolify videos in my free time, I went on to distract myself with other ‘productive’ endeavors. So I learned about the stock market, trading/investing, real estate. Also thought about writing a book. Meanwhile, I tried to adopt all the healthy habits I could think of in order to just recharge and refresh. While I continued feeling shame and guilt for dropping the ball on Toolify, if I’m being honest, I gradually found myself enjoying work more and more (the day job), and my role as a hardware lab manager which I’d recently taken on. Skipping forward a few months, I found a life coach (perhaps out of a bit of desperation) hoping to figure out why I stopped making Toolify videos. While I still can’t truly pinpoint why the excitement faded, the process did help me get clear on what it is that I’m excited about today: that thing is basically helping people experience as much joy and happiness as possible. To this effect, I’ve been working on what loosely resembles a personal finance blog – a resource with tips and tricks surrounding health, money, and happiness. Having gone through a roller coaster of experiences in the last few years, I feel I have something to contribute to the world. This blog isn’t live yet, but hopefully I’ll be ready to share it by end of the year. Reflecting: so that’s where my mind has been for the last 1-2 years. To all that got this far, sorry for the long-winded response. Sincerely hope my story helps someone/somewhere/somehow. I just really enjoy helping people. Toolify helped people in the woodworking niche, but I believe this new blog/endeavor can reach further and help even more people. Also, if anyone here wants to talk some more, please reach out. I still think one day I will come back to making Toolify videos – or perhaps I will even be fortunate enough to form a team that helps me realize the unrealized projects and ideas. I guess this remains to be seen. I am grateful for the FOG. I am grateful for people that left positive and supportive comments on my videos. I am grateful for all the experiences I’ve had thanks to this community. P.S. Also I apologize because I feel I'm hijacking this thread. Feel free to move this post if out of place. We grow; we move on. Glad you’re enjoying what you’re doing and finding different things to explore (and glad you graduated!). Good luck with the new endeavours and thanks for all the knowledge and inventiveness you shared. are you still involved in woodworking, on a personal level? I build only what I need at this point (mostly repairs around the house), so I'm involved but just a little bit.